Our Bridge to the Future™ teamwork activity is perfect for large groups. 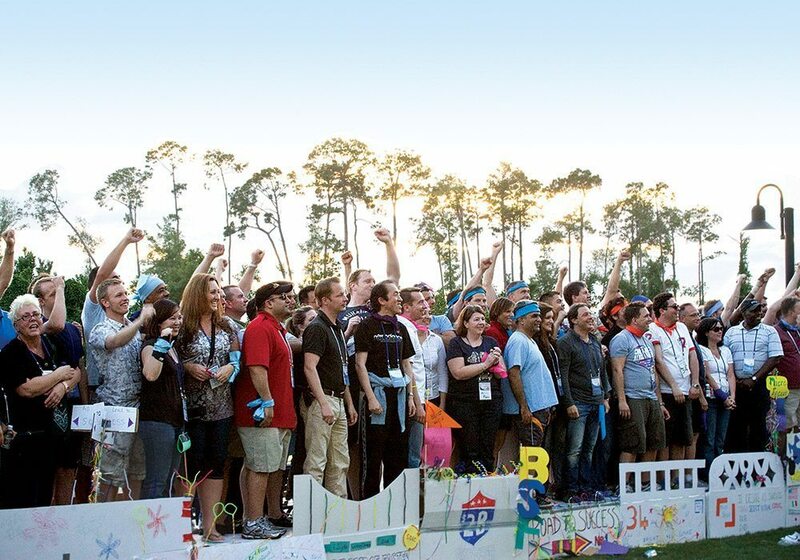 Sub-teams work together to build a bridge which represents the future goals and aspirations of your organization, and has the structural integrity to support the entire group for team pictures! There are two amazing aspects of this bridge building event. 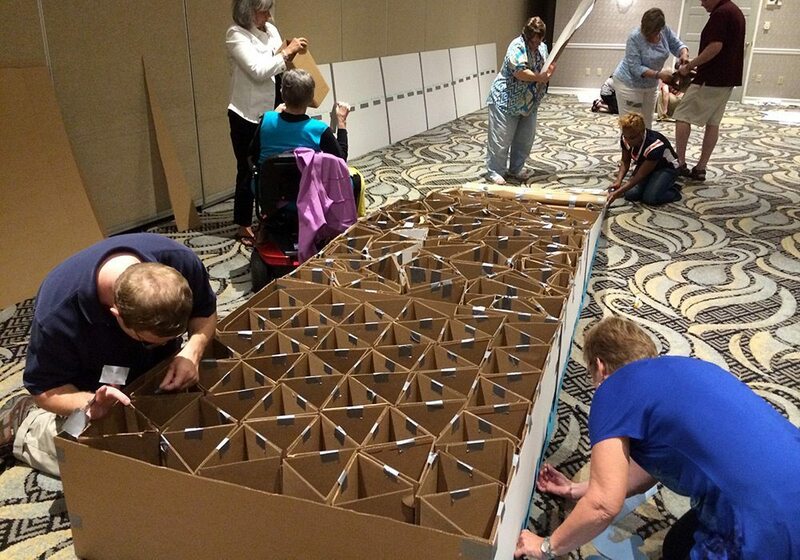 Each section will be an independent and artistic representation of the organization’s future mission and goals, AND the structure is assembled using only cardboard and duct tape as the principal building materials. With a focus on project management skills and creative ingenuity, leaders will be chosen and are responsible for ensuring tight deadlines are met. 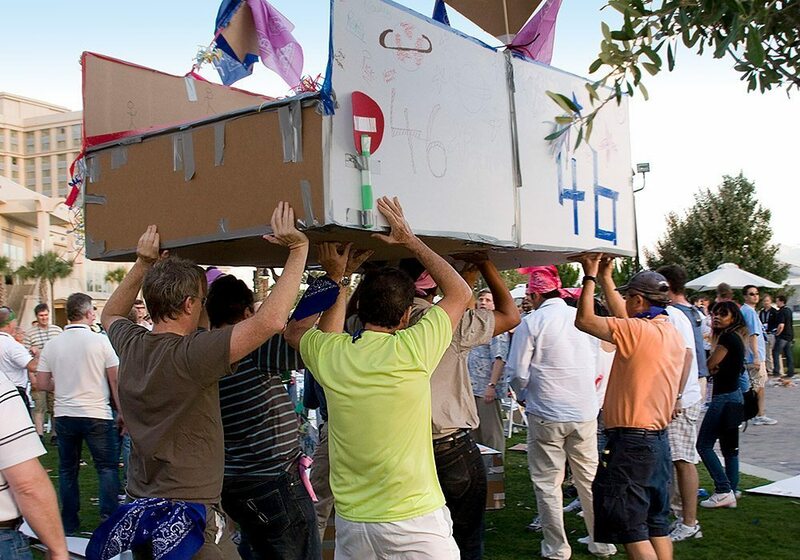 Each team will delegate roles including cardboard cutters, column designers, decorators, and builders. 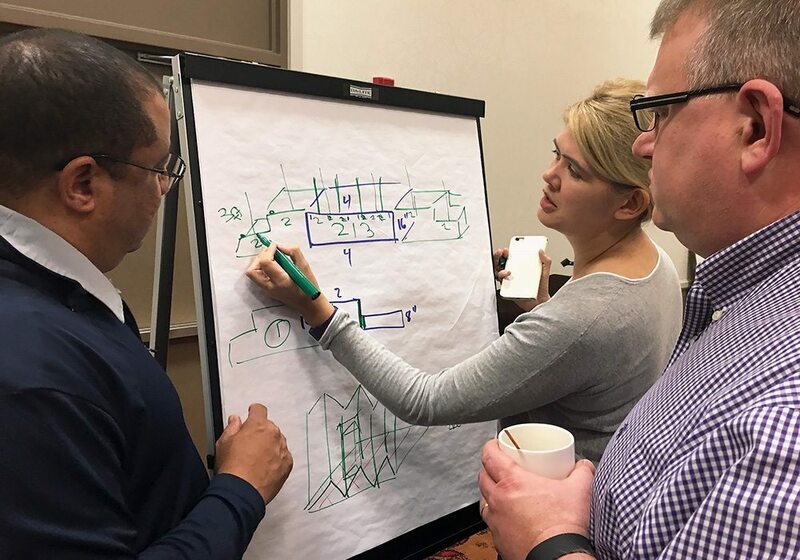 Team leaders will occasionally be called together for project manager meetings to discuss and share strategies, and to cross-share information with other leaders to ensure total success. These meetings are also critical since all of the sub-teams must complete their sections simultaneously to be brought together for the final bridge assembly. Once the bridge is completed, the entire group will walk onto the bridge to prove its structural integrity and to pose for memorable photos. 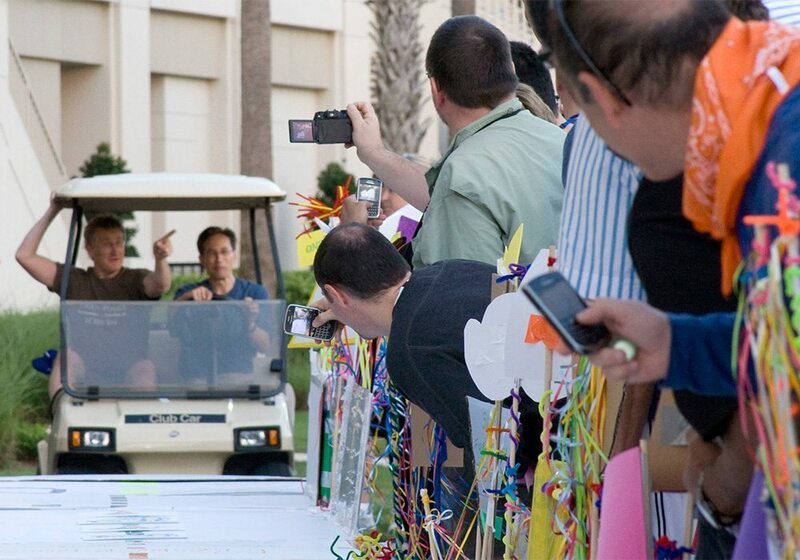 If a golf cart is available at the venue and accessible to the event space, for an added test of strength, it can be driven across the bridge to the cheers of your participants. I just want to thank you for a great team building event. Reaction from different departments has been positive, and everyone enjoyed the Bridge to the Future event. Thank for a job well done! 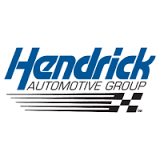 We look forward to doing business with you next year. I wanted to say a big thank you for such a successful event yesterday. I got nothing but rave reviews from all of our employees. I really appreciate that you took the time to fully understand our goals of our annual sales conference and implement them so well. The culmination of the event was exactly as I had hoped it would be. Leaving behind a difficult economic environment and embracing all the opportunities ahead of us. 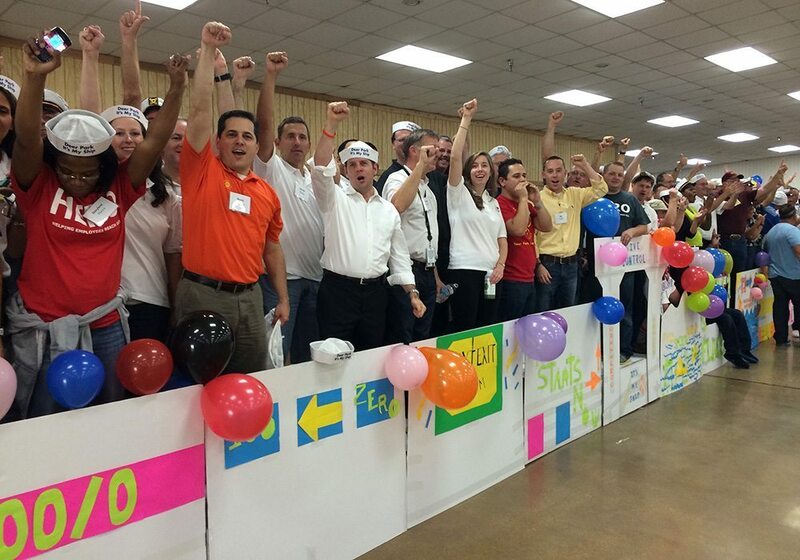 There were many team-building aspects to our Bridge to the Future event. It made us realized how we need each other. Moving engineers, placing people in the right places. Focus on the future. Identifying strengths and talents. The most fun was celebrating success together while walking across the bridge. Enjoying getting to know people from across the country that you don't know or rarely see. We seemed to all have a great time and it made us realize we have to come together to resolve issues. We have a lot of new people so it was good to meet and have this experience together. Apologies for not writing sooner to thank you, but the event was a HUGE success!! It was just amazing and your team were just what the company needed to start the week off right! Thanks again for all of your help. I will definitely be in touch for future events. I just wanted to send along a note of thanks for your facilitation of Bridge to the Future for our group last week. The team really enjoyed themselves and let loose their engineering and artistic abilities to build a sturdy bridge on which we could all stand together. As you add new team building programs, please keep me informed. I am happy to recommend Best Corporate Events to others here at Amcor. I wish you success going forward! Bridge to the Future was the ultimate building activity! The pressure to ensure that our section of the bridge would be strong enough to walk over made the activity very exciting. 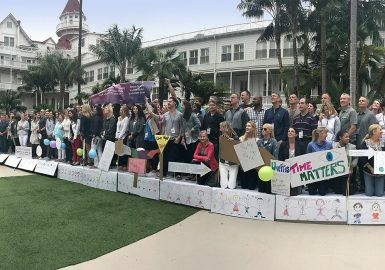 When we all stood on the bridge for pictures afterwards, I think that our manager said it best, “It was more than about building a bridge, it was building relationships that will carry into the future”, and that is exactly what we wanted from this event. Our group enjoyed their Bridge to the Future event. Working together to build something that we could all walk across, even if there were doubters in the group was a great team builder. I appreciated how your lead facilitator walked around and helped groups to ensure our success. Seeing everyone having fun and feeling accomplished after successfully walking across the completed bridge at the end of the program was the best. 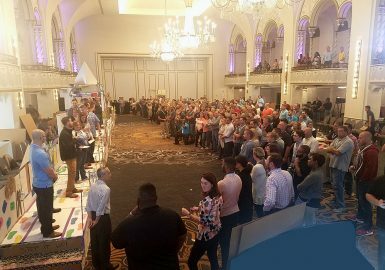 In "Bridge To The Future" the feedback that I received was the intro was a little too detailed and involved, but by the end of the evening, everyone was pitching in, doing their jobs and were engaged...and that's what you want for team-building events! WOW! We just had the "Bridge to the Future" activity today and it honestly could not have been better. The logistics were planned perfectly and our facilitator did an awesome job keeping everyone upbeat and highly engaged! We will definitely be using Best Corporate Events in the future! The facilitator and his group led the team on a positive, open minded no-excuses journey for 3 hours. It was a great experience! I had so many people thank me for organizing the best team building event they had participated in. The best part was the joining of strengths from Science, PR , Customer Service, H.R., etc., to create a bridge – leaving the past behind and looking to a positive future. Everyone enjoyed the hands-on nature of the activity and once together realizing the efforts they did individually contribute to the project as a whole. Your lead facilitator did an outstanding job communicating with the teams and keeping things moving. He gave enough information to make project successful yet let them determine how to make it all work. Building the individual areas and working as a team to complete them within the time constraints of the project was fun and challenging. Seeing all the sections together and everyone realizing as a whole it was a working bridge was very rewarding. 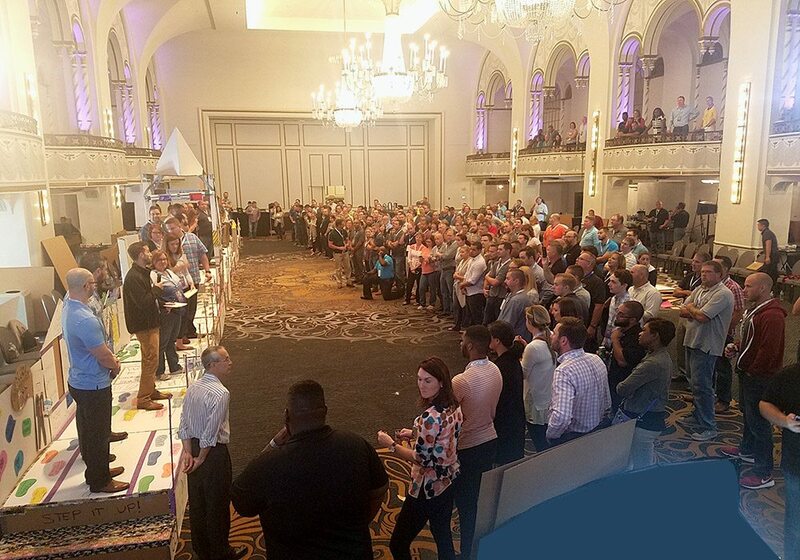 Overall, this was a great event and the client had positive comments from the minute the program started with the interactive icebreaker. Your lead facilitator put everyone’s mind (and anxiety level) at ease with his positive, customer service oriented attitude. It was never about his way of doing things but more about flexibility and what needs to be done to make sure the group had an enjoyable, and successful event. He had folks engaged (including the CEO and VP’s) from the onset of the program and the participation level was very high. As the liaison between Best Corporate Events and my client, I felt very comfortable releasing everything into his control and tried my best to stay out of the team’s way. Thanks for the partnership. They LOVED It! Our teams really had fun working together to get the bridge built. Getting everyone to follow instructions was an important teambuilding aspect of your extremely well organized Bridge to the Future event. We will be reaching out for future events since we had such a great time this time around. Having the employees from different Siemens sites working together to accomplish one common goal was great team building exercise. 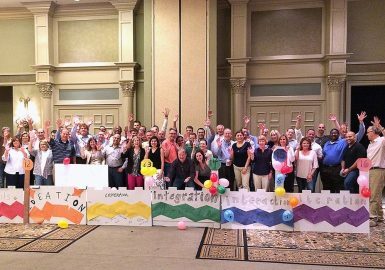 Our employees had a great time building their bridges and as a whole loved it and your facilitators made the employees feel at ease. We didn’t have any negative feedback about our Bridge to the Future. It was a great opportunity for the employees from different locations to meet each other since they will be interacting as the company transitions and develops its new vision. It was great, and our group wants another team building event set up in the next 12 months. Bridge to the Future was very hands on. The group enjoyed the end result after building the bridge and walking/ standing on it. The facilitator was very outgoing and in charge. The facilitator was extremely organized, fun and engaging. The crowd really responded well. The best part was seeing the group come together and work with people outside of their normal groups to accomplish a bigger objective. This was a totally new experience as a company to do something like this. Great experience. The best aspect of the program was the group working together to figure out who was the best at what and making it happen. The Ice Breakers and walking across the bridge were so fun. The whole group thought it was a great experience. The facilitator had great interaction with the group and we would recommend to any company. 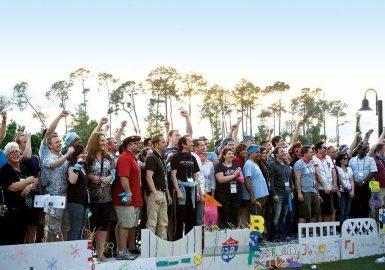 Pricing varies depending upon the number of participants (minimum of 30) and includes the team building program, prep, production coordination and all materials, program design, professional lead facilitator and staffing.